There is also a larger blue butterfly below that is 12 inches across at the widest point. And a medium sized one too. I wrote the pattern for all 3 and I'll share all 3 but you could really make them as big as you want once you main parts made... you'll see what I mean if you decide to make one! Ok, let's start with the red and pink one. 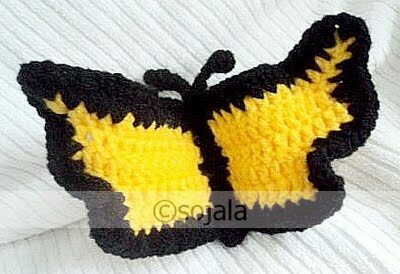 Now the pattern I came up with does better when made a bit bigger and I think this small one is as small as you can get it before the wing shape gets completely lost. Chain 11 with whatever color you choose. Chain 1 and turn, DC in next 2 and HDC in last. 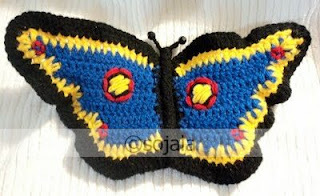 If you don't now, then you will see tied off ends on the backside of the finished butterfly. Pictured below you can see where I added some black yarn then I crocheted 2 side together with red yarn. You can choose whatever color you want to frame the inner wing. 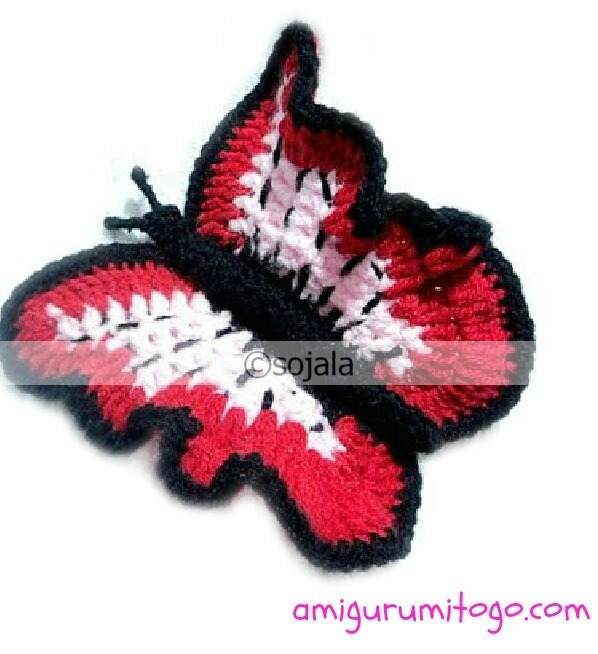 I chose red and then 2 double crochets all around the outer edge of the wing. ***The edge without the red yarn is where you'll add the body of the butterfly later. Ok, I added an extra short row of 2 double crochet's where you see the arrows pointing to. This is where you can get really creative and do many different things. Try out different things and see how it goes! After I got the red edge on, I single crocheted black ALL the way around. *** Now to make a body. I chained 21, but you decide how long you want the body to be. I then DC in each chain starting from the 4th chain from the hook. Chain 1 and turn then DC in each chain. Finish off and leave a long tail for sewing. I folded the body piece in half and sewed along the outer edge. Inserted a pipe cleaner that I folded in half and left out about an inch or so to be the antennae. Ok for the medium sized yellow one , I didn't add any other color to frame the inner wing but instead just framed it with a black edge. This one is just a bit different then the first one so read the instructions below. Sew wings to body and you've got a butterfly! Chain 17 with whatever color you choose. Make body and sew to wings and you've got another butterfly! Chain 21 with whatever color you choose. then with black I used SC along the body edge and the 2 DC around the wing. With this body I added 2 beads on the ends of the antennae. HI Mandy, actually All About Ami has a new lamb pattern coming out. They already have a blog post up with pictures of it and that pattern is coming sometime in the next few days, so just go to google and type in "All About Ami" and you'll see them there. Their new pattern is called "Cotton".